Level 1 sounds… basic. Like boot camp. Where you start. This is your first introduction to the education program and to be honest, I found it very confusing at the start. I didn’t understand how the projects worked and was often struggling with them. At the rollout of Pathways, nobody had any experience understanding the flow of Level 1. There are 4 projects in Level 1, but one of the projects, Evaluation and Feedback, has several distinct parts to it – 2 speeches PLUS an evaluation. So you have more work than you’d think. You start with the Ice Breaker speech project. In Project 2, you give a different speech from your Ice Braker. You’ll give it 2 times – the second time, you try to use the points of growth that your evaluator gave you to improve it. Then you serve as someone else’s evaluator. Finally, you have another speech that requires some research and organization. We’ll cover each of these projects in future podcasts – so stay tuned! 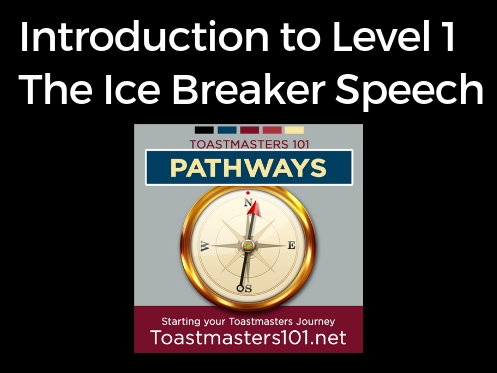 Where you start in Toastmasters is with the Ice Breaker Speech.